This morning I wanted to get a ride in as it was due to rain after lunch and it's also due to rain tomorrow. I asked my 10 year old son to come with me for the ride and suggested we go somewhere different this time. 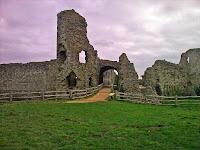 The first stop was to be Pevensey Castle. My original plan was to ride to the castle and back again but when I realised it was only 2 miles to the castle I decided to carry on further. 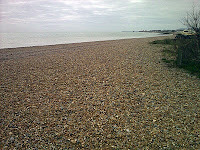 The next stop was the beach at Pevensey Bay where my son wanted to throw stones into the sea so we had a short break. We carried along National Cycle Route 21 until we reached ASDA next to Eastbourne's Sovereign Harbour. We carried on towards home deciding to take a detour via Shinewater Park. We arrived home just before lunch having covered 8.4 miles. My bum is aching again and my legs ache a bit too. Great stuff Toby, I'm impressed with the "Ride with GPS". I first saw it on the Massive Mountainbiker's blog, sadly I keep messing up putting my commute onto a map with it, IT is not my forte. Top man Toby. Great effort. I can't wait for my son to be old enough to pedal with me. Daughter is not interested now. Too bothered with make up trampolining and her pets. I'm well pleased with the distance however I'm feeling it now. I'll post later with the details. Grea work Toby. We holidayed at Pevensey last year, loved it, riding up and down the coast was brilliant. Such a lovely placed to cycle with kids.